On a given day in Cape Town, a person who likes flowers and who likes to walk has to make some decisions. 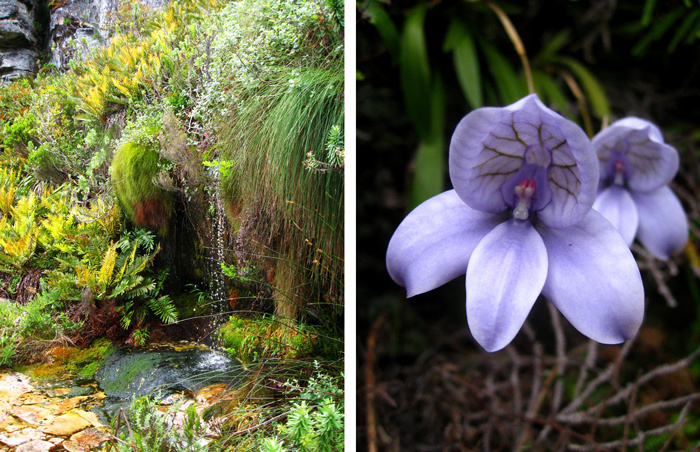 The destination is obvious – Table Mountain National Park. Its related ranges and hills stretch like a green-furred, irregular spine down the curved length of the Cape Peninsula. The city nudges each rising vertebra, the houses of suburbs and municipalities creep up the slopes, raising their elevation and property values as views stretch farther. On False Bay, as the sun lifts above the Hottentots-Holland Mountains in the east, early morning walkers shoulder backpacks and start a gradual climb into the mountains. On the opposite side of the peninsula, where the westerning sun dips its orange belly into the water, sepia light floods the small white beaches where people picnic by candlelight on Clifton. Above them, a paraglider spirals in to land, the lights of the city begin to blink, and headlamps on the slopes of Lion’s Head create pearled ropes that circle the domed rock, so that anywhere in the City Bowl or on the Atlantic Seaboard, the progress of hikers can be seen at night. If you have walked there yourself by moonlight you will know that the warm wind that breathes down the slopes in the evening carries the heavy perfume of Struthiola ciliata, a minute flower whose night scent attracts pollinating noctuid moths. The fragrance will become part of your delicate arsenal of memories. The early morning walk above Kalk Bay might reveal endemic Cape sugarbirds in those eastern mountains, perched atop a Mimetes fimbriifolius, with the the turquoise ocean as a backdrop. The birds’ long tails stream in the wind, which in midsummer can rattle your teeth if you are unprepared for the swift weather changes. On Table Mountain I once came across a girl in a green silk dress and bare feet, high heels in hand, an American who thought she could take a quick stroll from Kirstenbosch Botanical Garden to the cable station (“…I thought the mountain was flat!”) and who had become lost with her friends. They were being guided back down the slopes by a patient but unsurprised Samaritan. Ascend Skeleton Gorge, the most direct (and arduous) route to the aqueduct where scarlet Disa uniflora and shy Disa longicornu occur, their feet in clear mountain spring water, and you discover that there are in fact mountains within the mountain. Table Mountain might appear famously flat when viewed from the north, but on its summit a new world appears. Kloofs, cliffs, streams and peaks reveal the environment that makes Cape Town unique: a city wrapped around a national park. 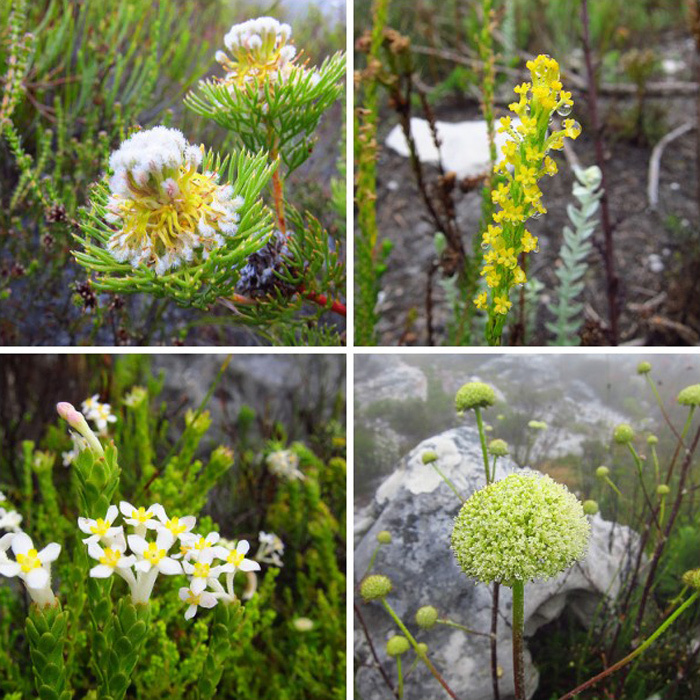 Microclimates created by sun-blistered rock, cold gale force winds, sandy soils, variable winter rain, dripping moss sheets, mist-wrapped peaks, sharp kloofs, and heat-scorched slopes are host to an intoxicatingly diverse floral world. 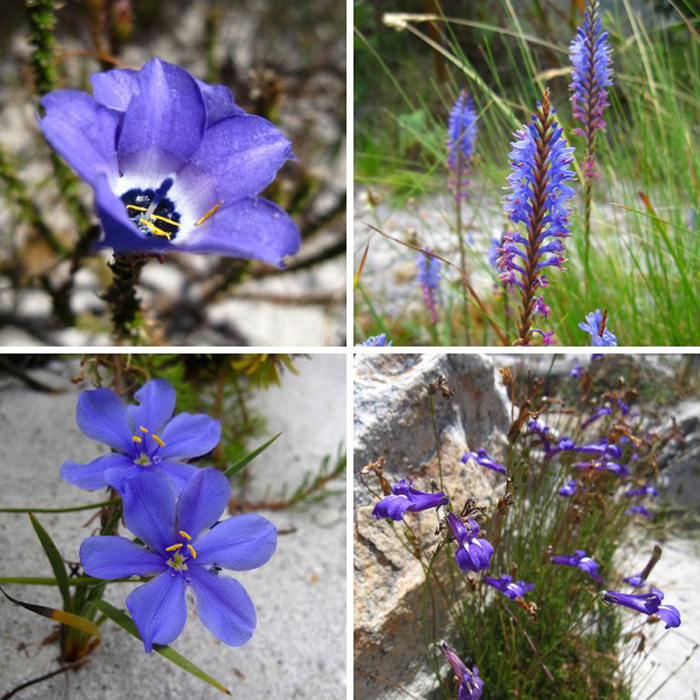 Of the six Floral Kingdoms in the world, the Cape Floral Kingdom is by far the smallest, occupying 0.01 percent of the earth’s surface and 4 percent of South Africa. It is the only Kingdom confined to one country and is amongst the richest in the world, with a total of more than 9,000 species, 70 percent of which are endemic*. Vegetation types are divided into six biomes. Four are zonal, determined by particular substrates in conjunction with local conditions they influence. 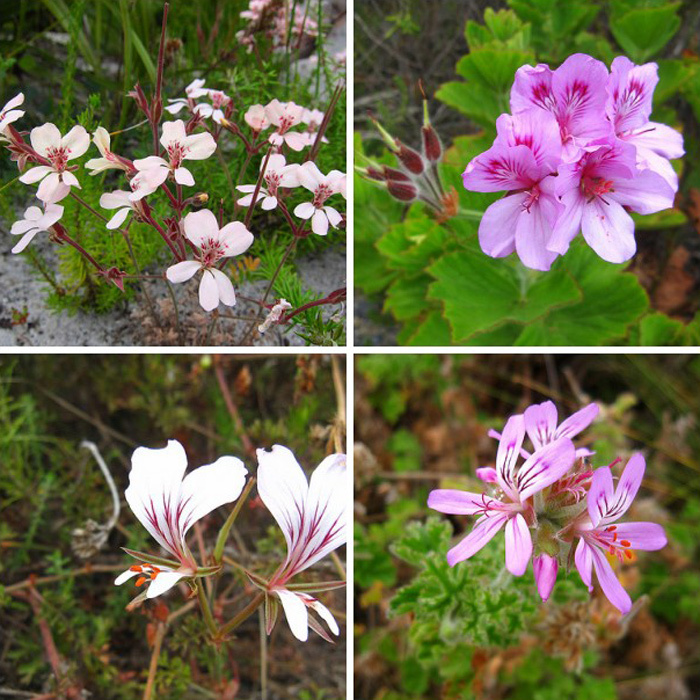 Fynbos is characterized by a mix of flowering shrubs (proteoids and ericoids), rushes (restoids), and perennial flowering bulbs and tubers (geophytes); Renosterveld, with its grassy understory, is highly threatened; Sub Tropical Thicket is dominated by shrubby succulents; and cool green Afromontane forest thrives in the more fertile kloofs. The two remaining biomes, Wetland and Strand Vegetation, are azonal, dependent not on substrate but on beaches and water. In a hike of a few hours, walking from a beach and onto a mountain, you will experience them all. Just be prepared. It might be 30°C in town, but pack something windbreaking. 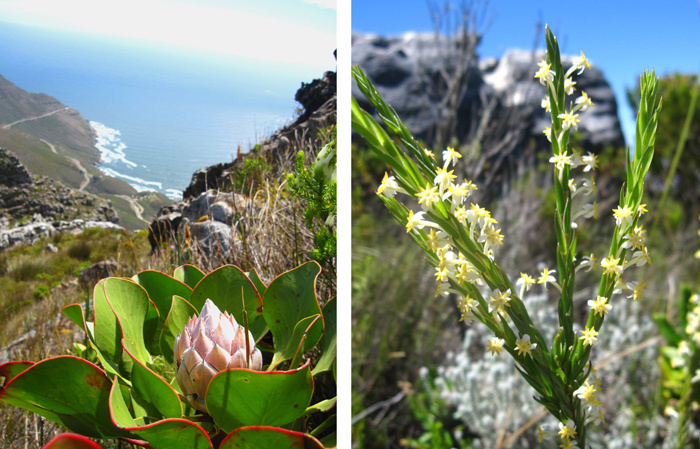 Whether you are headed for Noordhoek Ridge, its proteas and views of Hout Bay’s blue bite, or Orange Kloof via Cape Corner, or Kalk Bay Peak, in the east, chances are that the wind will blow or mist will descend. Or not. So, wear a cool T-shirt and serious sunscreen. Carry water in your pack. I drink from some streams I know well, but water sources can dry up. Take a map – Slingsby’s are the best. And tell someone where you are going and when you expect to be back. Do not wander off your trail. Every year people drop off this most accessible of mountains.